Got this 3" adjustable at the flea market this morning. Forged, good fit and action. Only marking is "Hong Kong". There is a similar 3" one marked "TAIWAN" which also looks plausible as a user tool. I have one of the Hong Kong ones but I wouldn't trust it to use. The one I have is made of pot metal or something similar, wouldn't trust it either. I bought a dozen of them on that auction site for giveaways. The quality was quite good, surprisingly. They had some kind of Chinese characters forged in the handle. I also have a Hong Kong and a Japanese one marked "Boys Japan". There is quite a collection of 4" Crescent types on the Spring Wrenching News Auction. Lot 294 has 11 under 4" key chain types. I especially like the Harley Davidson Lot 250. 0215. TIGER - TOOL STEEL MADE IN USA / TIGER-= FORGED - - 4" Crescent type. Tiger was a Gambles brand. 0216. TIGER - DROP FORGED TOOL STEEL / TIGER - MADE IN USA - - 4" Crescent type. Tiger was a Gambles brand. 0217. 4 INCH GRANCO IND USA (Granco Industries - Grandview, MO) / 100MM FORGED USA 11650 - - 4" Crescent type. Granco Industries manufactures specialty tools for the defense and aerospace industry. Excellent, like new. 0218. 704 AUTO? - LOS ANGELES - FORGED ALLOY STEEL / MADE IN USA - - 4" Crescent type. 0219. ARMSTRONG (with their arm and hammer logo) / 4in MADE IN USA - - 4" Crescent type. 0220. AW-4 - NAPA - USA / FORGED ALLOY STEEL - - 4" Crescent type. Excellent, like new. 0221. 3585A INDESTRO SUPER / FORGED ALLOY STEEL P - - 4" Crescent type. Excellent, like new. 0222. 3585 INDESTRO SUPER USA / FORGED ALLOY STEEL - - 4" Crescent type. 0223. 2085A DURO - INDESTRO / FORGED ALLOY STEEL P - - 4" Crescent type. 0224. 4in BET'R-GRIP - MADE IN USA / FORGED VANADIUM STEEL - 5/16 in - - 4" Crescent type with a 5/16" box end wrench on end of handle. 0225. No, 77-4" IREGA (in a shield logo) FULLY DROP FORGED STEEL - SPAIN / No, 77-4" IREGA (in a shield logo) ALLOY DROP FORGED - - 4" Crescent type. Excellent. 0226. 4in UTICA (in a three diamond logo) ALLOY STEEL / UTICA (in a three diamond logo) MADE IN USA - - 4" Crescent type. Wide handle variation. 0227. 91-4 UTICA TOOLS USA / UTICA ALLOY STEEL - - 4" Crescent type. 0228. BLACKHAWK USA / AW-1004-1 USA - - 4" Crescent type. 0229. 44 - XCELITE - ALLOY / ORCHARD-PARK - NY - - 4" Crescent type. 0230. 44 - XCELITE - ALLOY / ORCHARD PARK - NY - - 4" Crescent type. Excellent. like new. 0231. BET'R-GRIP - J. P. DANIELSON - JAMESTOWN, NY USA / FORGED VANADIUM STEEL - - 4" Crescent type. 0232. 904 RIDGID FORGED STEEL / 4" RIDGE TOOL CO. - ELYRIA, OHIO - MADE IN USA - - 4" Crescent type. 0233. 904 RIDGID FORGED STEEL / 4" RIDGE TOOL CO. - ELYRIA, OHIO - MADE IN USA - - 4" Crescent type. 0234. 4in S-K WAYNE - DEFIANCE OHIO / FORGED ALLOY IN USA - - 4" Crescent type. 0235. 4" S-K TOOLS / FORGED ALLOY IN USA - - 4" Crescent type. 0236. Marked only "4" and GERMANY - - 4" Crescent type with four geometric shaped cutouts in the handle. 0237. 4in BET'R GRIP - MADE IN USA / FORGED VANADIUM STEEL - - 4" Crescent type. 0238. 4in CRESCENT TOOL CO. / JAMESTOWN, N.Y. - - 4" early Crescent. 0239. HEAVY DUTY / CHROME VANADIUM - - 4" Crescent type with rectangular hang hole. Excellent, like new. 0240. 506-4 KLEIN TOOLS INC. / USA - - 4" Crescent type. Excellent, like new. 0243. Lot of Seven: Misc. 4" Crescent type wrenches (mostly imports). 0244. BARCALO BUFFALO / 4" DROP FORRGED STEEL - - 4" Crescent type. 0245. FORGED - BARCALO / 4" BUFFALO USA - - 4" Crescent type with two indented panels on each side and "top" shaped hang hole. 0246. ARMSTRONG 34-504 / MADE IN USA - - 4" Crescent type WITH BLACK FINISH. Excellent, like new. 0247. FAIRMOUNT / 4T MADE IN USA - - 4" Crescent type. 0248. THORSEN 56724 / EURO-STYLE WIDE GRIP - - 4" Crescent type. 0249. QUEEN CITY / BERGMAN O' BUFFALO - - 4" Crescent type. Curved handle variation. 0250. HARLEY DAVIDSON - - 4" Crescent type. 0251. 4R XCELITE ALLOY / ORCHARD PARK NY - - 4" Crescent type. 0252. XCELITE 44CG - - 4" Crescent type with plastic handle cover. 0253. HERBRAND NO. 21-4 - - 4" Crescent type. 0254. MAC AJ-4C / MAC TOOLS MADE IN USA - - 4" Crescent type. 0255. AW-4 NAPA USA / FORGED ALLOY STEEL - - 4" Crescent type. 0256. BONNEY / BW4 MADE IN USA - - 4" Crescent type. 0257. LACO DROP FORGED / MADE IN USA - - 4" Crescent type with Barcalo style "top shaped" hang hole. 0258. GREAT NECK / DROP FORGED - KOREA - - 4" Crescent type. 0259. BLUE-POINT FORGED ALLOY STEEL USA (with double ended arrow logo) / SNAP-ON TOOLS CORP. - KENOSHA, WISCONSIN - - 4" Crescent type. 0260. WARDS MASTER QUALITY / MOLYBDENUM ALLOY - - 4" Crescent type. Embossed (raised) markings variation. 0261. B4-4701 POWR-KRAFT / FORGED ALLOY STEEL USA - - 4" Crescent type. 0262. 90-4 UTICA (in a three diamond logo) TOOLS / FORGED ALLOY STEEL - - 4" Crescent type. 0263. GS (in a hexagon logo) DROP-FORGED TOOL-STEEL / GS (in a hexagon logo) MADE IN USA - - 4" Crescent type. 0264. TRUECRAFT 204 / CR VANADIUM TRUECRAFT - JAPAN - - 4" Crescent type. 0265. WIZARD H2400 / FORGED ALLOY STEEL MADE IN USA - - 4" Crescent type. 0266. WIZARD HR2400 / FORGED ALLOY STEEL MADE IN USA - - 4" Crescent type. 0267. K & B CO. - NEW HAVEN, CT. USA (Kilborn & Bishop Co) / 4IN ADJUSTABLE 22-1/2° - - 4" Crescent type with square hang hole for Prest-O-Lite automobile gas lights. 0268. STANLEY 85-336 / STANLEY 85-336 USA - - 4" Crescent type. 0269. KRAEUTER - DEFIANCE, OHIO / FORGED ALLOY IN USA - - 4" Crescent type. 0270. MM91-4 MASTER MECHANIC (True Value Hardware brand) / FORGED ALLOY STEEL USA - - 4" Crescent type. 0271. 4" SCHOLLER - - 4" Crescent type. 0272. 4in ANGLE ADJUSTABLE - PEXTO (in an oval logo) / PECK STOW &. WILCOX CO. USA - - 4" Crescent type. 0273. K-D FORGED USA 68604 / ALLOY STEEL - - 4" Crescent type. 0274. EASCO/K-D 68604 / FORGED ALLOY STEEL USA - - 4" Crescent type. 0275. P & C in a shield logo (Peterson and Carlborg) 1704-SL FORGED ALLOY STEEL / CLIK-STOP - PAT. MADE IN USA - - 4" Crescent type with black finish. P & C was acquired by Plomb in 1941. 0276. P & C in a shield logo (Peterson and Carlborg) 1704-L - MFD. USA / CLIK-STOP - PAT.PEND. FORGED ALLOY STEEL - - 4" Crescent type with plated finish. 0277. P & C in a shield logo (Peterson and Carlborg) 1704-L / CLIK-STOP - PAT.PEND. FORGED ALLOY STEEL - - 4" Crescent type with plated finish. 0278. 704-L PROTO FORGED ALLOY STEEL / CLIK-STOP PATENTED MFD USA - - 4" Crescent type with plated finish. 0279. 4204 PENENS CORP. - CHICAGO / FORGED ALLOY STEEL - - 4" Crescent type. 0280. 4204-S FLEET - - 4" Crescent type. 0281. 4004-S FLEET FORGED ALLOY STEEL / PENENS CORP. - CHICAGO - - 4" Crescent type. 0282. LAKESIDE (Montgomery Ward brand) DROP FORGED TOOL STEEL / LAKESIDE MADE IN USA - - 4" Crescent type. 0283. 7704 VACO - CHICAGO USA - - 4" Crescent type. 0284. 77-4 BILLINGS VITALLOY / HARTFORD, CONN. (with a "B in a triangle logo) MADE IN USA - - 4" Crescent type. 0294. 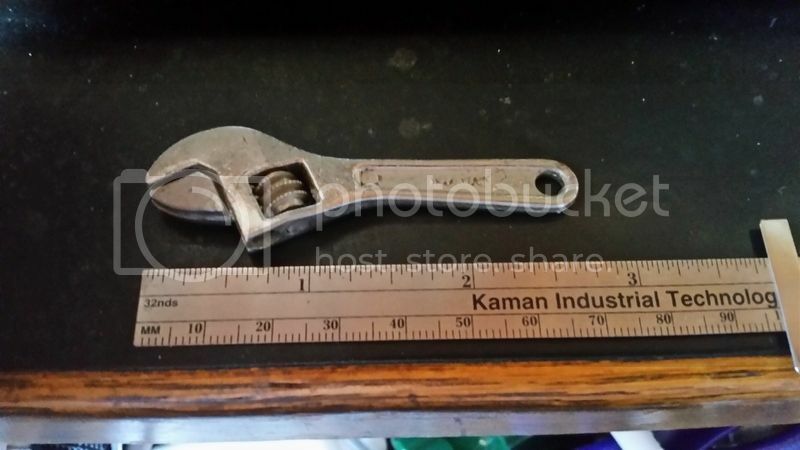 Lot of Eleven: Crescent type Adjustable Wrench Key Chains. One CRAFTSMAN / CHINA, the rest are Hong Kong, Spain, Taiwan, etc. All around 2.75". Wow, that's a bunch of wrenches. That #236 with the cut-outs looks pretty unique. I have several of the 4", but only 2 of the little 3" wrenches. One is a Hong Kong, and the other says Germany. I wonder where you find triangular nuts? Dammit, now I've got coffee on my keyboard!